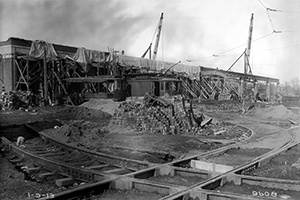 When opened in 1913, Luzerne Depot was the largest precast concrete structure in the world, with space for 355 trolleys, and room for 115 more in the yard alongside. 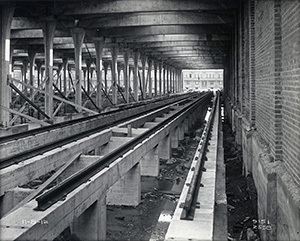 Built at the same time, Callowhill Depot in West Philadelphia was based on similar blueprints. To read my Hidden City Philadelphia article about Callowhill depot, please follow this link. 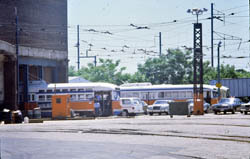 In the 1950's, after the National City Lines' takeover of PTC and the scrapping of over a thousand trolleys systemwide, part of Luzerne Depot was converted to a diesel bus garage. 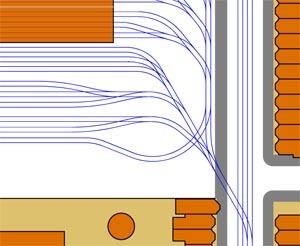 Gradually, more and more of Luzerne's ten 3-track bays were converted from rail to buses. Finally in 1992 all rail service was replaced with diesel buses. In April 1997, Luzerne Depot was closed, completely, despite SEPTA's 1992 promise to re-open the North Philadelphia streetcar system with new trolleys by 1997. Bus operations were moved to the new Midvale District, which was built with zero provision for streetcars. "The scope of work includes the demolition of the Luzerne Carhouse and Transportation Building, which is approximately a total of 40,000 square feet. The project site is located at the southeast corner of 1000-1100 West Luzerne Street, Philadelphia, PA 19140. The work also includes performing all required demolition and clean-up including removal, disposal, and salvage of existing at grade and above grade construction within the project boundaries as shown on the contract drawings." Update November 2003: Rather than demolition, a deal was struck that allowed a cardboard re-cycling business to occupy the structure. 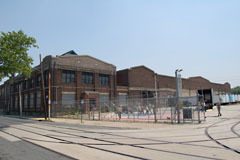 Update June 2007: Follow this link for photos of Luzerne Depot's current use, including photos taken inside the former trolley bays. Photos of the mothballed PCC fleet that was stored at Luzerne in winter 2001 can be viewed here. View a track map of Luzerne Depot showing the track configuration circa 1990. 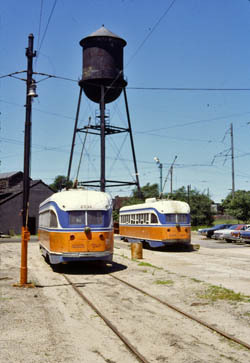 The northeast corner of Luzerne's car yard, at the corner of 10th and Luzerne Street, included the layover loop for the Route 53 trolley. Route 53's outer end served affluent West Mt. Airy, and when streamlined PCCs first arrived in Philadelphia, they were placed in service on this line. Prewar air cars like the two shown here provided service on this line until they were finally retired in 1982. Route 53 itself only lasted another four years after that. PCC cars 2075 and 2636 lay over on the Route 53 loop. Little Flower Catholic High School, and the trees of Hunting Park, are across Luzerne Street. This 1977 photo was taken during a 44-day strike by TWU Local 234. 7-bay, 8-bay and 9-bay contain idled PCC cars in four paint schemes: PTC green and cream, Toronto red and cream, and SEPTA Bicentennial red-white-and-blue, and SEPTA "mini-rehab" orange-white-and-blue. The car yard on the south side of Luzerne Depot was always an interesting place to poke around. In the late 70s, cars bound for the scrap yard were kept here, including a number of air cars that looked basically untouched since the 1940s. All-electrics and Kansas City cars in need of repair were kept here too. In this 1977 photo, two of the PCCs acquired third hand from Toronto Transit Commission await service. Ex-Birmingham Alabama PCC 2311, left, and Ex-Kansas City PCC 2250 are still in red Toronto Transit Commission paint. 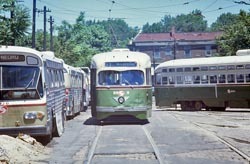 Both cars remained on SEPTA's roster until 1982. 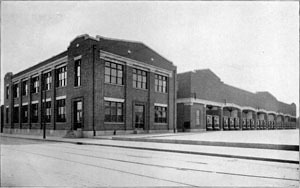 Luzerne Depot's "front" did not face any street. What would have been 12th Street was never developed on this block. When built in 1913, a conveyor belt system for sand occupied the second story above the doors. In a tradition dating back to the mid-1950's, all trolleys bought second- (or third-) hand from other cities operated from Luzerne Depot. Of the three cars in this photo, two are the native Philadelphian pre-war style "air cars," while the car in the center is an ex-Kansas City by-way-of Toronto car. PCC 2244 was recently overhauled, and in the process, lost its Toronto red paint, but retained TTC details like the blue spotlight on the roof. Also around 1980, some air cars, like 1942 PCC 2636 in this view, were repainted green and cream, omitting the maroon beltrail. Compare it to its appearance in the photo above. 1940 air cars 2535 and 2513 rest in the yard on the south side of Luzerne Depot. Starting September 5th (1976), Route 23 will return to rail operation, and be operated out of Luzerne, rather than Germantown Depot. This pamphlet is designed to help you in the transition to your new location. Luzerne Depot has 15 bus routes, with 355 bus operators, and 102 rail men who operate routes 6, 50, 53, and 60. Route 56 is temporarily operated by buses. The Depot Superintendent is Carl Unruh, and the Assistant is John Pio. They are there to assist you in any whatever way they can, so stop in and introduce yourself. Extra men on Route 23 will also work other Luzerne rail lines starting in September. Regular Route 23 men will have the opportunity to work other rail lines starting in January. Luzerne's Chief Instructor is Clarence Rowland. He and his instructors are there to improve our safety record and operator performance, and to help you whenever possible. Don't hesitate to ask them questions or seek their help. The Luzerne Shop Superintendent is Dave Helfrich and the Rail Foremen are Steve Stitsworth and Joe Curley. They are anxious to help with any problems you have connected with the equipment. When you take a car out of Luzerne and store it, you must do so according to the following plan. You must follow this plan unless specifically authorized by the Shop Foreman, an Instructor, or Supervisor, to do otherwise. Luzerne operates both electric cars (including ex-Toronto cars, for which you will be given a pamphlet listing those items that are different from our cars) and air cars. Normally, Route 23 will have air cars assigned to it (although electric cars may be assigned in specific cases). This should help you in your operation and provide greater reliability on Germantown Avenue's hills. Windshield wipers, sanders, and doors are air operated, instead of electric. There is also an air operated shoe brake on the tread, instead of the electric shaft brake. Since the air for this brake can leak off after a time (allowing the car to roll away), there is also a hand brake that must be set when the car is stored. The shoe brakes eliminate the need for a brake reset. These cars have an air gauge on the dash. Safe operation requires that you have at least 55 pounds of pressure before moving the car. By the way, RS&S has done a mini-rehab on the cars to be assigned to the Route 23. Graffiti has been removed, seats replaced, and in general, the cars are more attractive for our passengers. Your assistance in helping to curb vandalism and graffiti will be greatly appreciated. When another driver does something reckless and you're heading for a collision, you can't move the streetcar out of the way. South End: West on Luzerne Street, south on Old York Road to Germantown Avenue, then regular route to Bigler. Pull-In is Germantown to north on Old York Road to east on Erie, north on 10th Street to depot. North End: West on Luzerne to south on Old York Road to Germantown, and then north onto regular route. Pull-In is south on Germantown to east on Tioga to north on 13th Street to west on Venango to north on Germantown to east on Erie to north on 10th Street to Depot. The aerial view at right was taken in March 1992, six months before the last of the North Philadelphia streetcar lines were converted to diesel bus. By this time, only two trolley lines operated from Luzerne: routes 23 and 56. And of those last two routes, diesels buses were often substituted for months at at time, whenever utility construction occured along those routes. Gone were the days when temporary tracks were built during construction and contractors were instructed to work around the streetcars. It was simply easier to suspend trolley service. Serve the public? "Buses are good enough for 'em." In this 1992 photo, most of the vehicles visible are buses. The two vehicles emerging from the shadows at the lower left corner of the building (8- and 9-bay) appear to be PCC cars.